Eyewitness Travel Guides are the original illustrated travel reference and throughout 2003, the entire list of more than 70 destinations is being fully updated to show you more of what other guides only tell you. With a stunning, brand-new look, Eyewitness Travel Guides are essential reading for vacation, business, or armchair travel. Consistently chosen over the competitiEyewitness Travel Guides are the original illustrated travel reference and throughout 2003, the entire list of more than 70 destinations is being fully updated to show you more of what other guides only tell you. With a stunning, brand-new look, Eyewitness Travel Guides are essential reading for vacation, business, or armchair travel. Consistently chosen over the competition in national consumer market research, Eyewitness Travel Guides include up-to-date information on local customs, currency, medical services, transportation, and much more. New Zealand is one of the most beautiful places in the world. I am so glad I found this book and tried to make new adventures just by reading. But of course, still wanted to experience in real. with what this book has described the beautiful places of New Zealand, I could not wait any longer to step my feet on that certain places. I like the Eyewitness series for the initial stages of trip planning. These full color guidebooks have tons of pictures. I had an idea before reading this of where I wanted to go in New Zealand, but reading through this book made me realize how much more there is to see than I initially thought. It has also made planning an itinerary extremely difficult since I want to go everywhere. [2011.11.30] Used for the New Zealand protion of our Nov-Dec 2011 trip. DK Eyewitness books always have lots of pictures and are great for brainstorming. Too heavy too bring on the trip itself, but we did copy and bring the 2-pager on Arthur's Pass which we drove through in the opposite direction presented in the book. 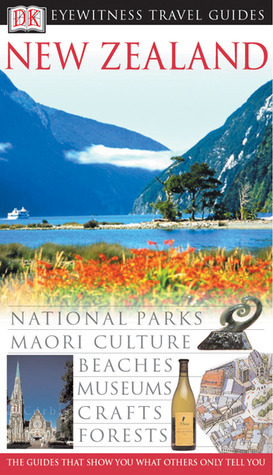 A great book to have whilst travelling or to simply get a flavour for NZ before you go. I'm actually reading this all the time planning my next adventure!!! Hope to make it to NZ while my guidebook is still relevant! I think I just don't like the DK style of books. It's very visually cluttered to me so I can't always easily find what I want to know. love the DK Eyewitness travel books.